“How much of a good thing can we take?” – I hear you all ask! 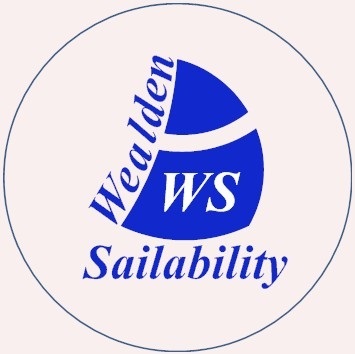 Today was another fabulous day for sailing, albeit the strong winds that WS Racers had to battle on the last three race days and which were predicted to be with us again today did not materialise. But we did enjoy a dry, sunny day with a brisk and chilly wind. With the course set, the beat upwind, from the Start Line at Mark A, to Mark C and the reach across to Mark K were both affected by the trees on the north shore disturbing the flow of the NNE wind and resulted in random wind shifts and eddies. Only the downwind leg of the course from Mark K to Mark A gave the Racers a consistent wind. So the combination of the course and the wind’s behaviour around Mark C and across the lake to Mark K made sailing very tricky and challenging for everyone – except perhaps for Peter Gregory whose Red Torpedo was sailed skilfully and majestically through the fleet. Peter needed less than 20 minutes after starting sailing to be at the head of the fleet. (Well done Peter! Ed) This performance has put Peter in first place for the Summer Series, just one point ahead of Kim, with one race to go. 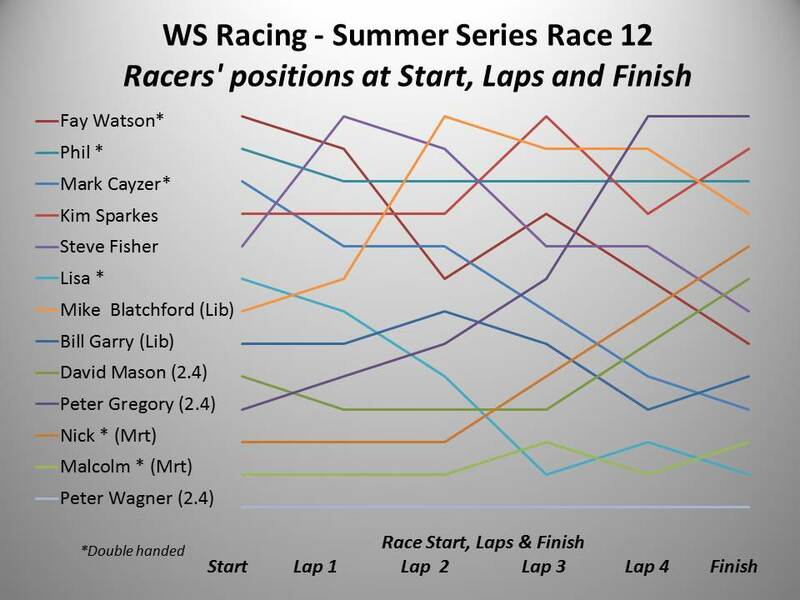 The usual schematic that shows where each Racer was across the Start Line and then at the end of each Lap and at the end of 40 minutes, and the final result for today’s race, is shown below the pictures of some of the WS Racers who took part and the summary results for the Summer Series – with just one race remaining – can be seen by clicking the Racing / Results tab above. Final Result: 1. Peter G; 2. Kim; 3. Phil / Helen; 4. Mike B; 5. Nick / Chris; 6. David Mason; 7. Steve; 8. Fay / James: 9. Bill Garry; 10. Mark / Mike; 11. Malcolm / John; 12. Lisa / Paul; 13. Peter W.
I was ready to hurl my jib pole in the lake today, as it kept knocking me in the head! I think John needs to have a look at possibly tightening up the bungee cord on 108. However in the afternoon I tried the servo steering… and it is a unusual sensation. One point I would like to point out to the volunteers is that you do need to use the jib switch quite a lot depending on wind strengths and direction of the boat. I thought Steve Fisher sounded more sports like and representative of us both. Bob Farmer sounds like the bloke in the corner of a pub supping pints of real ale, not us definitely. I can I apologise to all those boats that I managed to come together with/put off during the race. A combination of the conditions and rusty sailing I’m afraid but hopefully nothing disastrous happened to the recipients. Thanks again to all the volunteers. Farmer…Fisher….in my mind both sportsmen who need the occasional pint of real ale to sustain their performances!! Steve, as I told you, I thought you sailed very well yesterday (especially after walking a few miles to get to Chipstead!) and now I have read your effusive apology to every dinghy on the lake, I understand how you finished so high up the fleet! Clearly there were a number of Mexican stand-offs which I did not spot – and nobody protested (even informally during the lunch break!). I am sorry to read of your health woes Bob and I hope you will be able to join us – even if only in the Race Boat – for the final Race of the season. Peter – BIG APOLOGIES for giving you a poorly prepared dinghy – again! I have spoken to a Trustee about the need to ensure we check the rigging when we launch and set up the 2.4s. After lunch, it took me 10 minutes PLUS expert advice from Peter Gregory, to sort out the problem which you had with the Jib Boom. And now I have seen what the problem is, I know that 2.4 #108 needs more attention than just the replacement of the bungee cord. An “ex” is a has-been. A “spurt” is a drip under pressure. So an “expert” is a has-been drip under pressure. Methinks someone else is going to be hit by Peter’s boom on Thursday!